Details have emerged early about the new Galaxy S8 Active from a user purporting to have the device in hand, with pictures surfacing showing that the edge-to-edge Infinity Display featured heavily in advertising is absent from the ruggedized phone. If the device examined is in fact the Galaxy S8 Active, it apparently has a 5.8-inch uncurved display, with notable bezels on the sides and top of the device. 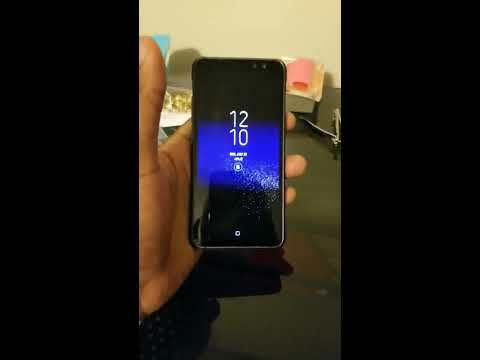 The phone lacks the remappable "Active" button of previous models, with the button dedicated to Samsung's Bixby voice assistant technology on the new device. The S8 active also has a larger 4,000mAh battery than its non-ruggedized progenitor. The Galaxy S8 has a 3000mAh battery, with the S8 Plus packing 3500mAh. As a result, the user reports that it is about 1.5x times thicker than the 8mm Galaxy S8. The sides are metal, with a polymer back to the phone. Otherwise, the device has the same Snapdragon 835 processor with 64GB of storage, and 4GB of application RAM. The cameras remain the same as well. The Reddit post first publishing the pictures of the device has since been deleted. The leaker claims to have obtained the device from a Samsung employee in California. Well of course it's absent, Samsung will eventually ditch both the curved display and the bixby button in less than two years. That actually looks better, though the overall design is a bit clunky (I guess it's OK for 'ruggedized' look.) The screen edge curved around was kind of silly... more of a 'look what we can do' than for any real purpose (and I'd guess, some very real downsides). Let's just hope Apple isn't copying that, only to be left in the dust of trend-change. I'm just trusting their taste is better than that. Is anyone seriously confused as to why you wouldn't have an edge to edge display on a ruggedised phone? There are a couple of visible downsides when using curved screens. You see the same reflections on the curved edges in an iPhone, but....there is no image to look at, underneath those highlights, because there is no screen underneath them. 2. Bent sides of the screen have a different angle to the viewer, comparing to the rest of the screen. Color/brightness distortion and irregularity is another problem. Man, its a ugly phone; better be able to throw it... Cause you'll need that "function". Hmm, how many times has Apple copied Samsung only to be left in the dust of trends? Just joking (a bit). It does seem like Apple is concerning itself more with fashion these days than style.